Germany became united between 1862 and1871 as a result of the Danish War (1862) Austria- Prussian War (1866) and Franco-Prussian War (1870), as well as the sense of nationalism that sprang from these struggles. Also, Otto von Bismarck’s policy of setting the German people against other ethnic groups, such as the Danish or French, to unite the Germans, became a success as a result of the victory over these other groups. Biafrans are now united because of a sense of nationalism that was inculcated in us by our great and dynamic leader, Mazi Nnamdi Kanu. But before I continue, I want to explain the term 'UNIFICATION'. Unification means an act of joining people, things, part of a country etc together to form a single unit or body. Nnamdi kanu has done a great job by joining South South and South East together again since the divide and rule tactics which was introduced by obasanjo and co since 1997. Before the so called divide and rule came into place, we were all Called and addressed as 'Easterners' or Eastern Nigeria and we were living peacefully. But when the divide and rule game came, story changed. They now began to tell someone from River State that Igbo man is his problem and to Akwaibom man, that Igbo-Biafran is his problem. But in all these, they have never for one day pinpointed any bad thing that an Igbo-Biafran had really done wrong to these people. Though I see that as wickedness and malicious ambition. This is because they have seen the great wisdom and knowledge in Igbo-Biafrans that's why they want to do anything humanly possible to suppress it. Nobody on earth has ever come up with one single offence that an Igbo-Biafran has committed that brought about all these hatred. Igbos are the most wisest and most knowledgeable species in the planet earth and for that, those who are not happy about that are trying to do something possible in order to disassociate them from their brothers being given the so-called Name 'South South' according to baboon of Otah (Obasanjo) and the former British impostor. All these rubbish are what Nnamdi kanu saw and vowed to restore the unity of the Biafran people back, as it was originally, and by the grace of God(Chukwu okike Abiama) he succeeded. Before, AkwaIbom man sees an Igbo man as his worst enemy for no just reason. But today, the reverse has been the case. Now for example, if an Akwaibom man or Bayalsa man sees an Igbo man, he will take him as his blood brother and so in other part of Biafra land. Our people didn't realize this before, that it was those people that brought about this divide and rule game that was their problem and not their Igbo brethren. And when Nnamdi Kanu begin to explain this to the understanding of our Biafrans, they began to come together United. Now our people can know and understand that it was these rogues who formed this division and also the same beneficiaries of our natural resources (oil). While the owners of the oil are the securities guiding the pipeline and these impostors and rogues are those holding the key and major positions in the oil industries, very sad! Thank God Nnamdi kanu has lectured us about this and our people can now reason like proper human beings without influence from their divided and rule puppets. All these people that have introduced this rubbish called Divide and Rule can never reveal this to you. Even some of our people who feels that they benefits from the oil, cannot tell you these things. It is only the leader of the Indigenous People of Biafra Mazi Nnamdi Kanu that has leaked these secret for our people to know the kind situation that this people put us into. But it is quite unfortunate that there are still some of our people whom this divide and rule game are still rocking in their brain, so sad! This unification has gone a long way in uniting our people and also restore peace and love among Biafrans. A million thanks to the leader of the lndigenous People of Biafra Mazi Nnamdi kanu who made it possible. Again, the slogan "ONURU UBE NWANNE AGBANA OSO" is another thing that Mazi Nnamdi Kanu has introduced to our people which is of a great help to Biafrans especially IPOB. Any body who calls himself a true IPOB member can testify to this. Onuru Ube Nwanne Agbana Oso means that you cannot see your brother in trouble or in need and you overlook him/her. No! days has gone when our people think in that manner. Today, Nnamdi kanu has made us to know that we are all one flesh and blood. The same blood (we share the same DNA) that is running in your vein is the same one running in the vein of your other brother from Izon, Ibibio, Igala, Igede, Igbanke to mention but a few. We are all one no matter your tribe or your language. I know how many time we have contributed for the welfare of our members, not withstanding your tribe or where you come from. This is as a follow up and as a result of Mazi Nnamdi Kanu's unification ideology and orientation. You too can share the same testimony only if you can do the needful thing which is to join the struggle with every truth and honest not with compromise or sabotage. Nobody who is in this movement that ever regrets unless you have different agenda in mind. Finally, I once again say a big thanks to Mazi Nnamdi Kanu who devoted his time and energy to lecture our people on many things that they never knew before. When we call him great teacher, some people may not know what we actually mean except the students of Radio Biafra. Nnamdi has taught Biafrans what their grandparents has never taught them or even their teachers too. He has opened the brains and eyes horizon of many that was blocked from the ages passed. He is also the brain behind the present Biafra restoration, radio Biafra and unification of South South and South East, and I say kudos to him. He is the Joshua of our time, most often, people refer him as the Moses of our time, and I say no to that, this is because Moses did not enter the promise land though he worked for it. But Mazi Nnamdi as the Joshua of our time will see Biafra and enter into it. In fact without mincing word, he is the one who will lead us into that holy city called Biafra which flows with milk and honey. Well articulated. 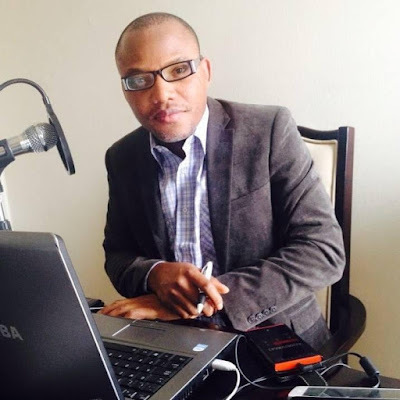 Nnamdi Kanu is not only a genius but a courageous human-being. He is a great BIafran leader.